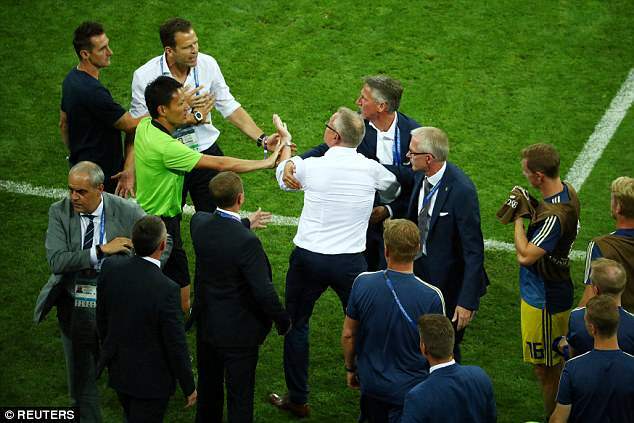 Sweden, Germany, get it into post-match battle! 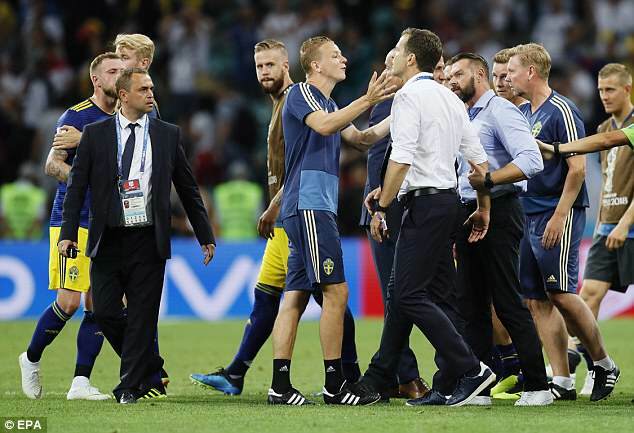 Tensions were running very high among the Sweden camp following Germany‘s last-gasp victory in the World Cup clash on Saturday. Toni Kroos snatched the all-important three points for Germany right at the death, to keep their World Cup hopes alive while leaving Sweden in a precarious position. 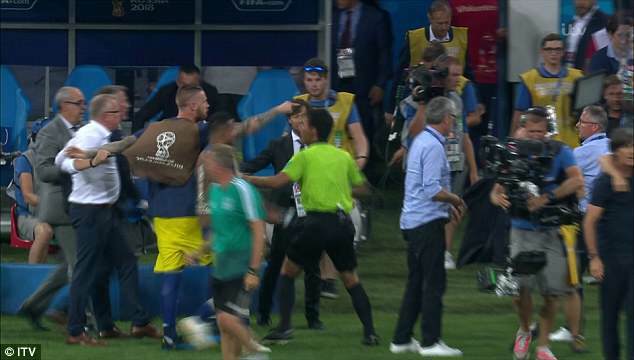 And following Kroos’ brilliant free-kick, Janne Andersson and the Sweden camp clashed with their opponents on the sidelines after Germany were accused of ‘rubbing it in’ during their celebrations. 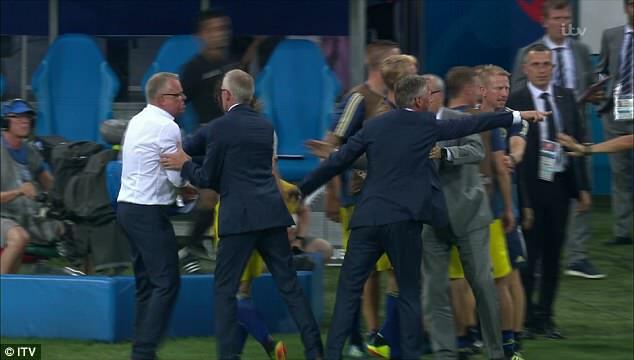 Sweden manager Andersson said after the final whistle: ‘Some of the German leaders of the team celebrated by running in our direction and rubbing into our faces by making gestures and that really got me annoyed and angry. ‘There were many people on our bench that were annoyed. We fought it out for 95 minutes and when the final whistle goes you shake hands and leave. So I was very angry. 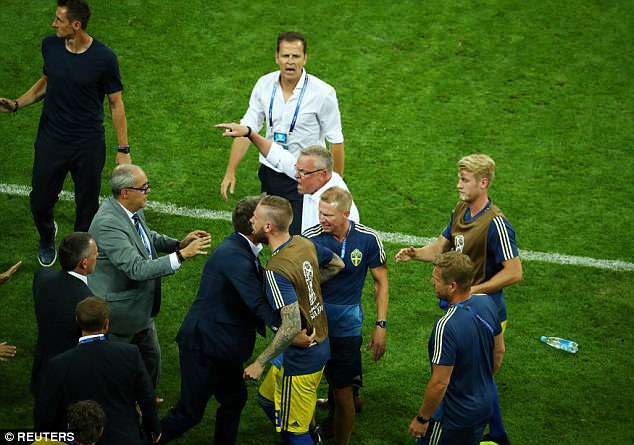 Some of the Sweden camp could even be seen pushing their German counterparts as tensions rose at the death in Sochi. 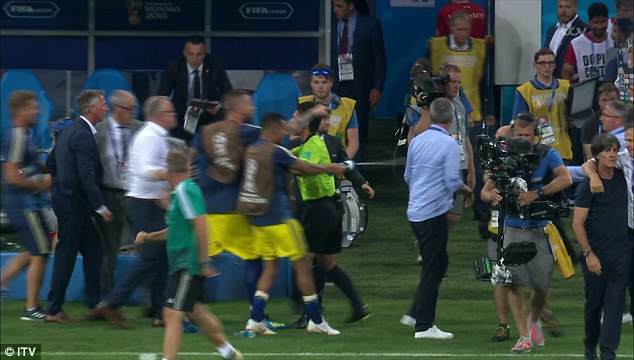 And while the pushing and shoving was going on on the sidelines, Martin Olsson took matters into his own hands by squirting his water bottle at the Germans. 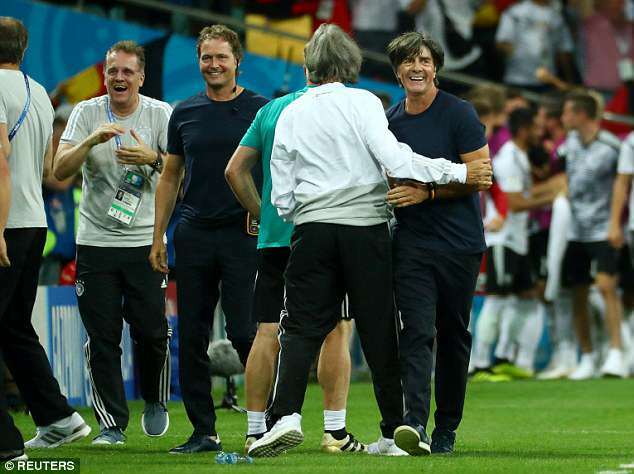 However, Joachim Low has defended his staff, insisting he was not aware of any taunting. ‘Who made gestures, did I make a gesture? I didn’t witness that because after the final whistle we were concentrating on other things. We fell into each other’s arms and were so elated. I didn’t see any aggressive gestures,’ Low said. 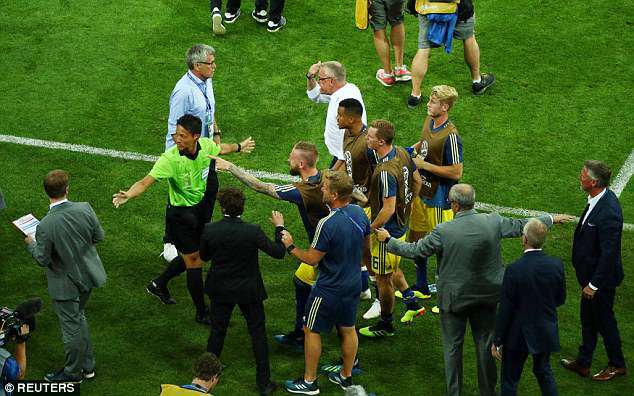 With a minute to go of the World Cup clash, Sweden had their destiny in their own hands. However, the last-gasp defeat has left them with it all to do going into the final group game against Mexico, who have won their first two matches. Mexico sit top on six points, while Germany – who face South Korea next – and Sweden are tied on three each in Russia.